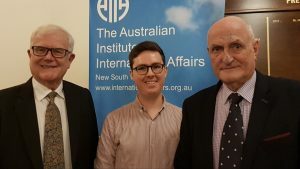 On Tuesday 2nd April, AIIA NSW hosted immediate past AIIA NSW President and former Ambassador to Mexico, Richard Broinowski, who spoke on the recent inauguration of Mexican President Andrés Manuel López Obrador and how he will face the pressure from a hostile United States to deal with the US-Mexico border crisis. Mexico’s history, according to Mr Broinowski, is a complicated mare’s nest. From Hernán Cortéz’s Spanish conquest of the Aztec Empire through to the present day, Mexican history has been dominated by a series of revolutions and conflicts against both its colonisers and neighbours. Since the early 20th century, Mr Broinowski argued, Mexico has had a somewhat schizophrenic approach to government where successive administrations from the long-ruling party, the PRI, have had to balance revolutionary zeal with the PRI’s conservative politics. Obrador, commonly known as AMLO, bucks this trend, being the first President since the Mexican Revolution not hailing from the PRI or its predecessors. His social democratic values and humanistic streak put him at odds with recent conservative administrations focused on neoliberalism but fraught with internal instability. AMLO’s approach to the border crisis, noted Mr Broinowski, has highlighted his humanistic streak, including the relocation of Mexico’s migration department to Tijuana on the border with California. However, AMLO’s conciliatory attitude directly opposes the hardline approach taken by US President Trump, who has deployed the military to patrol the border and has recently threatened to close the border entirely. Despite this tension and rhetoric, the US-Mexico border remains a vital trade and transit route. More than 350 million people travel between the two countries each year via just 44 land border entries, and many towns and cities that straddle the border are deeply interdependent on each other economically. Any attempt to close the border by Trump could cause significant economic damage to both the US and Mexico. The border issue, like many of Mexico’s contemporary issues, is steeped in history. Young Mexican men would previously traverse the border seeking better employment prospects in the US black economy, despite the racial discrimination entrenched in the National Origins Act of 1924 and brutality perpetrated against Mexicans by early US border patrols. Today, with Mexico’s improving economic prospects, most migrants hail from the Northern Triangle of Central America composed of Guatemala, El Salvador and Honduras. The instability, institutionalised violence and embedded corruption caused by drugs and violent regime changes have forced thousands to flee to seek refuge in the US. Trump’s recent decision to suspend aid to these countries as a tool to stop these migrant caravans, Mr Broinowski argued, could prove counterproductive in stopping the border crisis and may increase the pressures on people to leave, possibly echoing the refugee crisis in Europe that resulted from destabilisation in the Middle East. Mr Broinowski noted that AMLO seeks more constructive engagement with the US to deal with the border crisis, even with Trump’s vehement belief that Mexico is to blame for the border situation and that it should foot the bill for the border wall. However, continuing instability in the Northern Triangle and Trump’s move to pull US aid to Guatemala, El Salvador and Honduras will likely only aggravate the border situation even more. AMLO’s idealistic administration is still in its first few months, so it is difficult to predict what will happen – things could dramatically change at the drop of a Trump tweet.